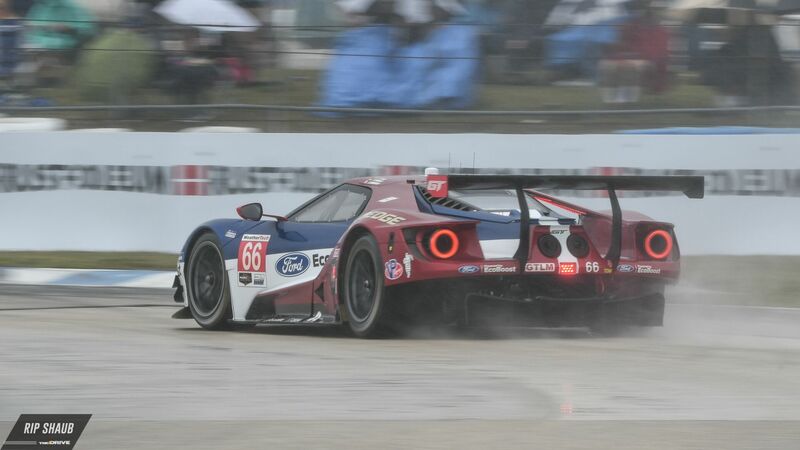 Saturday's edition of the 12 Hours of Sebring was, as expected, a race filled with attrition and trials for IMSA's top programs. Initial frontrunners retired, contenders dropped to the back of the pack, and a familiar face appeared in Victory Lane in the form of Pipo Derani who, driving the No. 31 Whelen Engineering Cadillac DPi, propelled his teammates Eric Curran and Felipe Nasr to P1 at day's end for the first time at the Florida track. The half-day event began how the Rolex 24 at Daytona ended—rain-soaked with drivers desperate for grip. Acura Team Penske's No. 6 entry was on pole in the DPi category while the No. 911 Porsche RSR started first in GTLM; the No. 52 Oreca was fastest in LMP2 qualifying and the pro-am GTD class was led by Meyer Shank Racing's No. 86 Acura NSX GT3 Evo at the green flag. An early safety car was deployed to control the pace of the field in the wet. Once this was lifted, drivers were given the go-ahead but remained cautious as they had learned from the pain-staking season-opener which featured two red flags and a shortened race length. The Cadillacs quickly showed their prowess with Wayne Taylor Racing and both Team Action Express cars competing for first throughout the opening hours. Mazda Team Joest was once again looking quick but the No. 77 Mazda RT24-P expired in the second hour due to an electrical issue. Meanwhile, the lone Nissan-powered prototype of CORE Autosport had to make up time following a sub-par qualifying result. Action picked up near the eighth hour as Nasr passed Matthieu Vaxviere, who was driving the No. 10 WTR Cadillac, for the lead. This proved the strength of the No. 31 Whelen crew who was showing promise as day turned to night. This promoted a battle between the two teams in the closing hours as the Team AXR Mustang Sampling team would also be in on the fun. Derani was leading Brendon Hartley in the No. 5 Mustang Sampling entry by 48 seconds when a caution was called, removing the gap and bunching them up for the restart near the 10th hour. This also brought the No. 10 WTR car, who was running in third at the time, to the front. Finally, a fifth full-course caution was issued with only 16 minutes left when Bill Auberlen's No. 96 Turner Motorsport BMW M6 GT3 suffered a broken suspension. This once again diminished any advantages and made for an all-out sprint to the checkered flag. At the time of the yellow, the top two teams in each class were separated by less than two seconds. 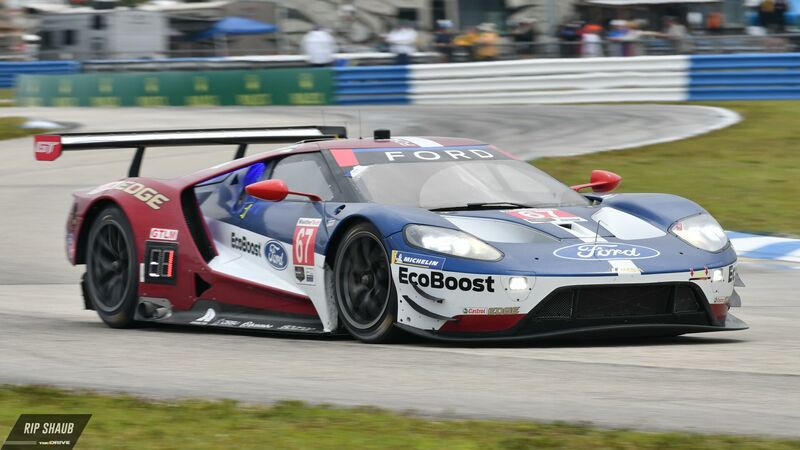 Derani would decisively pilot his car across the finish line, claiming his third career victory at the 12 Hours of Sebring. Despite starting from the pole, the No. 911 Porsche crew of Patrick Pilet, Nick Tandy, and Frederic Makowiecki fell several laps down over the course of the rainy hours. In their place, Chip Ganassi Racing's No. 67 Ford GT became a fighter for the top along with the No. 3 Corvette Racing C7.R. The latter was leading in the second half of the race when the No. 911 Porsche recovered from its initial woes. Tandy was in the driver's seat when the fourth caution of the race was in place, and upon the restart, he charged hard from fourth to second. It was then that he'd challenge Antonio Garcia in the No. 3 Corvette, who conclusively gave up the lead with 36 minutes to go by stopping in the pits. This was the first green lap led by the polesitters and they managed to retain their position through to the end of the race, making for a waft of excitement on the pit wall. Joey Hand would finish the race in second driving the No. 66 CGR Ford GT and the No. 24 Team RLL BMW M8 GTE would complete the GTLM class podium. The Lamborghini Huracan GT3 Evos were dominant once again in IMSA's GTD class as Grasser Racing Team narrowly edged the No. 44 Magnus Racing outfit for victory. Just 2.724 seconds separated the two when the checkered flag was flown, but the team of Mirko Bortolotti, Rolf Ineichen, and Rik Breukers would prevail at the legendary endurance race. Toni Vilander rounded out the podium in his WeatherTech-sponsored No. 63 Scuderia Corsa Ferrari 488 GT3. Just two entries were fielded in the pro-am LMP2 category: Performance Tech Motorsports and PR1 Mathiasen Motorsport. The former usurped the latter when a third-hour issue cost them any shot at the win, relinquishing the glory to Kyle Masson, Cameron Cassels, and Anders Fjordbach in the No. 38 Oreca. Performance Tech crossed the finish line 14 laps ahead of the PR1 Mathiasen group, earning their first victory of the 2019 season. IMSA's WeatherTech Series will race next at the Bubba Burger Grand Prix at Long Beach on April 14 when the DPi and GTLM categories assault the Californian streets in a 100-minute sprint. What do you do after setting the benchmark for oldest-ever IMSA race victor? Try and win again the next year, of course.